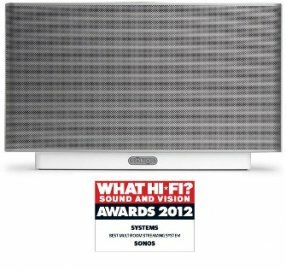 Sonos PLAY:5 Wireless Hifi System in White delivers crystal clear room filling sound. This all-in-one player lets you stream your entire music library, music services, and radio stations. All this can be done wirelessly with this easy to set up player. This 5 Driver HiFi Speaker System offers room filling sound. Sonos PLAY:5 was formerly known as ZonePlayer S5. Also known as PLAY5, PLAY 5, Play 5. Headphone: Auto-detecting 3.5 mm headphone connection. The PLAY:5?s integrated speakers mute when headphones are inserted. Five driver speaker system ? two tweeters, two 3? mid-range drivers, and one 3.5? woofer. Each driver of the product is individually powered by a dedicated amplifier. Stereo Pair Setting: Allows you to group two PLAY:5 units in the same room with one PLAY:5 serving as the left channel and the other as the right channel. Apple Airplay Music Sources: Connect an Apple AirPlay® music source, such as an Apple AirPort Express® to any Sonos ZonePlayer with line-in. Enjoy songs from your iPhone®, iPad® or iPod touch® in any or every room of the home.Connect an Apple AirPort Express® to any Sonos ZonePlayer via line-in and stream songs from your iPhone®, iPad® or iPod touch® all over your home.